We would like to thank Nicholas Lewis for first bringing an apparent anomaly in the trend calculation to our attention. We quickly realized that our calculations incorrectly treated systematic errors in the O2 measurements as if they were random errors in the error propagation. This led to under-reporting of the overall uncertainty and also caused the ocean heat uptake to be shifted high through the application of a weighted least squares fit. In addition, we realized that the uncertainties in the assumption of a constant land O2:C exchange ratio of 1.1 in the calculation of the “atmospheric potential oxygen” (APO) trend had not been propagated through to the final trend. I would have hoped that the authors had learned their lesson and released the code with the data. It does not make immediate sense that, if you change the correlation structure of the errors, the central estimate changes too, from 1.33 to 1.21, not if N=1,000,000. We owe the authors thanls for both exemplary candor and their prompt corrigendum. Thanks for clarifying, Ralph. I am still confused by the remaining discrepancy between the best-estimate of the corrected trend you now report for ΔAPOClimate (i.e. 1.05 per meg/yr) vs the Lewis best estimate of this same quantity (i.e. 0.88 per meg/yr). What is the reason for this? By my calculation, 1.21 J/yr will increase the temperature of the oceans by .002 C/yr. That’s a 2 C increase per millennia. I’m underwhelmed. God, I love real scientists. Gavin, thank for addressing my earlier comment (#5). I understand the first point related to treatment of OR. But am still confused by your second point. My interpretation of the Lewis analysis (https://judithcurry.com/2018/11/06/a-major-problem-with-the-resplandy-et-al-ocean-heat-uptake-paper/) is that his estimate of the ΔAPOClimate trend is 0.88 ± 0.56 per meg/yr. So am I correct in interpreting the second part of your comment as meaning that the way Lewis calculated the trend (least square fit to values in Extended Data Table 4 of paper) is incorrect and therefore his central estimate of 0.88 per meg/yr is incorrect? What is this “meg” unit. The paper says it will define it in the Methods, but it actually doesn’t. While this episode turned out well, it does raise again many uncomfortable questions about peer review, how press releases are constructed and whether they are a good idea or not, and the role of outsiders in science. It also brings into focus the recent critique of science as it currently functions that may finally be gaining some traction behind the scenes even though most scientists religiously avoid mentioning it or discussing it in public. Many scientific errors or skewed papers continue to wrongly influence public policy for decades with perhaps the dietary fat issue being one of the most visible and egregious. In this case, the errors were quite easy to spot on even a cursory examination of the data for an outsider. Did any of the reviewers actually read the paper? My guess is that none attempted to independently replicate the statistical analysis. My experience is that peer review is usually quite cursory and if the paper is “part of the scientific consensus” or the author is known to the reviewers no one ever checks any of the work. Should peer review be compensated? Should outsiders be included in the review process? The press release with this paper contained obvious errors for example the idea about ECS estimates being effected. Who writes these things and what purpose do they serve for advancing knowledge? Finally, this episode demonstrates as many others over the last 30 years the role of “gentleman” scientists. In the 18th century most scientists were of this type. As science got bigger, Universities became the preferred profession of those aspiring to be scientists. After WWII science became big business and scientists were often a blend of entrepreneur, public relations flak, and managers of large teams of postdocs and students, with little time left over for actual technical work. The most prolific publishers can not even have read all the papers on which they are authors much less checked any of the results. Perhaps the scientific community needs to more wisely use the often free services of “gentlemen” scientists, those who are in retirement, and particularly professional statisticians. It continues to amaze me that most science outside medicine seems to avoid placing a professional statistician on the team and listening to him. Paul P, It appears to me that the issues Lewis identified were both more or less correct. The rate was much too high and the uncertainty much too low. Nic of course also said that the paper should have been published because its a novel method for estimating ocean heat content changes and that once corrected it substantiated other estimates. Why are you trying to smear Nic by referring to errors made by someone else whose relationship to Nic is unknown to you? Guilt by association is not a valuable contribution to the discussion of anything. “In the updated calculations we now also allow apply the OR range (1.05 ± 0.05) to the APO calculation which by itself increases the APOClimate trend by 0.15 ± 0.15 per meg/y­r relative to an estimate using 1.1.” Thus if they had used to original value of 1.1 (as in the original paper) their rate would go down to roughly 0.90 per meg/yr. I guess Nic got 0.88. “he states unequivocally ‘that all of the paper’s findings are wrong’“. My take, correct me if I’ve misunderstood. While Lewis is technically correct, still “wrong” here sounds like a weasel word, meant to sound worse than it is. Substitute “off” for wrong. Example, if one makes an error toward the beginning of a long, complicated calculation, everything after that error will also be off. It’s an innocent mistake but the net result is that the entire calculation is thrown off. Unfortunately, however, in the minds of an already skeptical conservative public, egged on by right-wing media (which reliably will always ascribe the very worst of motives to that they hate) and paid for by dirty energy, ALL studies that support AGW are now suspect. Going forward, perfection is required, though I suspect that’s always the goal. I would expect this novel proxy method to underestimate the true change in OHC. The large uncertainties are in the deep ocean, prior to Argo below 700 m, and below 2000 m until the Deep Argo project has delivered enough data. I don’t think that these deep ocean waters reach oxygen equilibrium with the atmosphere in a few decades (the Resplandy et al study started in 1991). So, there should be a significant lag between this method and direct temperature measurements in the ocean. The real stuff is always the best. Since 2007 when Argo reached its target deployment, we have good data and relatively little disagreement between different OHC datasets. Since 2007 the NOAA-Levitus 0-2000 m OHC has a trend of 1.14 * 10^22 J per year. Assuming that 10-15 % of the ocean warming goes below 2000 raises the total ocean warming to 1.26-1.34 * 10^22 J per year. If the ocean warming represents 93% of the global energy imbalance, this suggests 0.84-0.89 W/m2 as an average for the period. Prasad Kasibhatla wrote ” So am I correct in interpreting the second part of your comment as meaning that the way Lewis calculated the trend (least square fit to values in Extended Data Table 4 of paper) is incorrect and therefore his central estimate of 0.88 per meg/yr is incorrect? You are both mistaken as to what I did. I calculated the OLS trends for all the members of a very large ensemble and took their mean and standard deviation, as stated in the article to which Prasad Kasibhatla refers (note 13), which I, like Gavin, think is what the paper’s authors did. incorrectly treating systematic errors in the O2 measurements However, unlike the paper’s authors (see https://scripps.ucsd.edu/news/study-ocean-warming-detected-atmospheric-gas-measurements), I did treat systematic errors in the O2 measurements correctly. Contrary to Gavin’s speculation, the mean of the trends for all members of the ensemble is essentially identical to that of the ensemble mean, as I would expect to be the case here. I have analysed the APO data in Extended Data Table 4 and checked the paper’s results. I found that the linear trend in the dAPO_Climate data was 0.88 per meg per year, not 1.16 per meg per year as claimed. Moreover the claimed uncertainty in this trend was far smaller than what I calculate using the data error distributions. As the paper’s ocean heat uptake rate is derived by applying a conversion factor to its dAPO_Climate trend, this means that all of the paper’s findings are wrong. What findings in Resplandy et al. still stand that are NOT affected by the errors detailed by Lewis in his two posts? Yes you mention identifying an independent method of detecting ocean warming. That is commendable. However, is not the quantitative significance of that method entirely changed by the corrections Lewis identified? PS your comment on Esschenbach is a Ad Hominem logical fallacy (Red Herring and Genetic). Please follow the scientific method and raise that in a new post. If that’s the case, why did Lewis say (on the record) “that all of the paper’s findings are wrong” ? That’s a savage criticism for someone to state that wants to be considered an honest peer-reviewer. So it appears Lewis said that only to hype his own standing? You are the one that brought up the idea of “gentleman scientists”. Here we have Lewis’ colleague Eschenbach, who a few days ago said the modern-day warming in California was equivalent to the change in lapse rate from a person’s head-to-toe, yesterday changed that to being the 4th floor of a building, and then it was pointed out that since 1895 it’s equivalent to 150 meters in altitude! And Resplandy was off by 1.21 ± 0.72 x 10^22 J/yr vs. previously 1.33 ± 0.20 x 10^22 J/yr according to the corrections, with a widening of uncertainty due to noise in the earliest measurements. The bottom-line is that the hype concerning this issue is totally out of proportion to the amount of fake science that is permeating the social media. Nic Lewis, thanks for clarifying. But I continue to be puzzled. My reading of your blog post https://judithcurry.com/2018/11/06/a-major-problem-with-the-resplandy-et-al-ocean-heat-uptake-paper/ is that your estimate of the ΔAPOClimate trend is 0.88 ± 0.56 per meg/yr. Is that correct? If so, it seems to me that the latest estimate by Ralph Keeling (1.05 ± 0.62 per meg/y­r) is still inconsistent with your estimate, in terms of the central estimate. And your estimate does not even include the OR correction that led to the decrease in Ralph’s central estimate from what was published. I am puzzled by this discrepancy in the central estimates. David Young, re you comment #14 – it then leads to the question as to why the central estimate in the published paper was not 0.90 per meg/yr. Well Paul, You dodged the issue. Willis Eschenbach is not a “colleague” of Nic Lewis in any meaningful sense. The APO climate trend went from 1.16 per meg year to 0.90 (almost identical to Nic’s value) using a consistent method to compute the quantity. Only by changing the OR range input does this become 1.05. What this shows is that there is a further source of uncertainty here that requires “choices.” In my book, that’s not an insignificant change in the result and certainly brings it into better agreement with past results. Prasad, This is explained in the main post. “In our definition ΔAPO, we used a default value of 1.1 for O2:C oxidative ratio (OR) of land carbon. However, a lower ratio is probably more appropriate. Specifically, Randerson et al. (2006) argued for a ratio of around 1.05, based on the composition of stems and wood, given that woody biomass dominates long­term carbon sources and sinks on land. Other recent studies have suggested similar ratios e.g. Clay and Worrall (2015). Our previous calculations did, in fact, allow for a range from 1.05 ± 0.05, consistent with above estimates and typical uncertainty ranges. 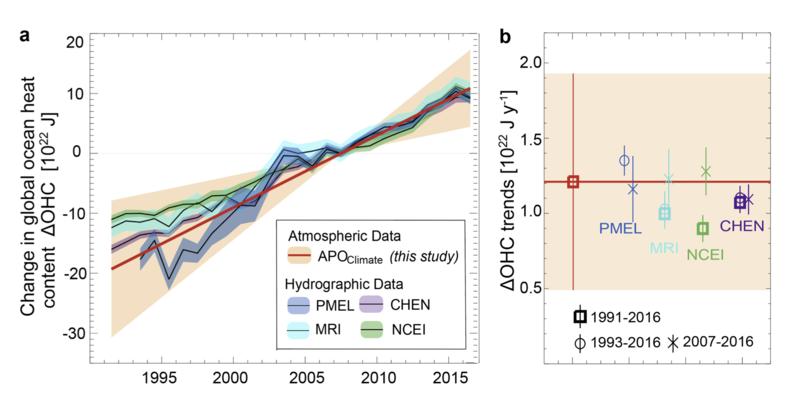 However, we applied this range only for the ΔAPOClimate­ to­ ΔOHC ratio but neglected the impact on the APO budget itself, which used a fixed ratio of 1.1. If the actual OR were lower than 1.1, the observed APO decrease (ΔAPOOBS) would include a contribution from the global land carbon sink, because the ΔO2 term then imperfectly cancels the 1.1 ΔCO2 term. What is the basis for you calling Eschenbach « Lewis’ colleague »?? He clearly isn’t. Sven, They are of similar rank in the blogosphere and interact, therefore by definition they are colleagues. Suppose could call them fellow bloggers, but you may not be happy with that either. Many thanks for putting in the time to produce this and your previous post – both very informative. David Young, I understand the OR issue but what has that to do with the issue that Nic Lewis brought up re the central estimate? The OR issue seems to be an additional issue that is now been thrown into the mix – but it appears to be unrelated to the discrepancy in the central estimate that Nic Lewis brought up. Nic Lewis suggests in his blog that the reason between his central estimate and what the authors reported in the paper might be because the authors mistakenly reported the trend for ΔAPOClimate + ΔAPOAtmD instead of the trend for just ΔAPOClimate. Is that what happened? I have not seen that question directly addressed. similar rank in the blogosphere and interact, therefore by definition they are colleagues. Well, that’s a novel use of the word. As though accumulating blog followers amounted to peer-review and as though blog rank equated to journal publication rather than advertising success. Why, you could hire a CEO consultant to increase yours any time you wanted more colleagues! In comment #6 – By my calculation, 1.21 J/yr will increase the temperature of the oceans by .002 C/yr. That’s a 2 C increase per millennia. I’m underwhelmed. Gavin did not challenge the assertion that the heating was only 2 thousandths of a degree per year. Is this correct? Now, let us for a moment imagine the response of the blogosphere, if the correction were to go the OTHER way… ;-). Hank, I didn’t mean rank in that sense, but rank in the sense that Lewis and Eschenbach are both lieutenants in the blogging medium. Colleague (def): an associate or coworker and often of similar rank or state : a fellow worker or professional. I do agree with you that the rank popularity of the blog, such as with WUWT’s Alexa rank, has nothing to do with the quality of the science practiced there. Lewis only suggests the failure to strip-out ΔAPO(AtmD) from the ΔAPO(Climate) regression as “one possibility” although if that were the cause of the ΔAPO(Climate) trend being calculated as +1.16 per meg/yr it would also have seemingly required the result to be incorrectly rounded up from +1.153 per meg/yr. Mind, the Lewis result of +0.88 per meg/yr creates a linear trend result which passes above the 1991 datum value at a rather-impossible infinite s.d. as the 1991 datum is presented with zero uncertainty. Thanks. I was trying to figure out how they could be difficult. No. At the time I wrote my original article it seemed one possible explanation for the difference in our calculated trends, the reason for which was unclear. It subsequently became clear that the reason was actually that Resplandy et al had used weighted least squares regression, which they now agree caused the trend estimate to be shifted high, rather than the usual ordinary least squares regression. The quality of the science isn’t determined by blogging. It’s whether scientists cite the work approvingly as useful for a starting point to further work. Could someone please explain this in layman terms. I have seen people posting this correction and using it to say climate change is a lie made up by scientists and this proves it. Richard, I think you can find any dubious conclusion about anything on the internet. Someone can correct me if I’m wrong, but it seems to me the original paper said pretty explicitly “its worse than we thought because ECS is probably higher than we thought” and this message was dutifully hyped in a press release and by the media who always exaggerate how serious things are. The corrected paper does not really have any significant implications for climate science so far as I can tell and has no implications for any calculation of carbon budgets for a given temp increase, etc. No, Gavin indicated that your applying the heating to the entire volume of the ocean in order to smugly dismiss it as: “That’s a 2 C increase per millennia. I’m underwhelmed” – misses the point. It misses the point, because the heating is not uniformly applied to the entire volume of the ocean, but concentrated in the upper layer – and it is this layer that counts – as it directly affected by the atmosphere and has a direct effect on the temperature of the atmosphere (and atm. water vapour) and therefore the climate. And in this layer that – the warming has ALREADY been 0.5C. It is as if somebody in New Orleans when informed about the coming 8.5 metre storm surge – dismissed it by saying “that’s only a 0.2% of the average ocean depth. I’m underwhelmed”. This is similar to the discovery of the MBH98 misuse of statistics by Steve McIntyre, who though at the time unfamiliar with climatology, recognized the errors inherent in the plot of the ‘hockey stick’ graph. I do not know if this “comment” is within the policies of this website. We need to jumpstart the world’s migration from fossil fuels to GREEN energy. At my website, MAGiKool.org, there is a plan to do exactly raise and spend $2 trillion in the next 10 years migrating to assist renewable/sustainable energy resources. Please take a moment to download both the word document and the excel workbook to read my proposal and review the first two years operating budget in the workbook. I welcome your comments, suggestions and criticisms please tell me what they are. I am not like Donald Trump I can take criticism gracefully and accept it graciously! Nic Lewis, re Comment 36, thanks for clarifying! let us for a moment imagine the response of the blogosphere, if the correction were to go the OTHER way… ;-). No Piotr, I also clapped softly when Christy & Spencer came clean about UAH’s inverted radiometric temperature trend. Students here are still taught that when you are wrong, you shoud publish a correction. I didn’t direct it at you, but at the skeptics blogosphere. If not for any other reason – I don’t know your posts, but I remember their reaction, when NOAA adjusted NOAA NCEI data – instead of rejoicing that now we have a better data set, the denialists were shouting from the rooftops: NOAA conspiracy and propaganda. So, Paul, you have an error in an important scientific publication pointed out and your contribution is to drag down the person who pointed out the error in status and rank but making as lowly (in your mind) a comparison as possible? Why the cheapness? It doesn’t cost you anything to include a link, does it? How are readers supposed to know what the paper is about, what the errors pointed out where, and then understand the response above? Thanks MA Rodger and Mr KIA. I can see now that the centrifugal part of the gravity effect at the equator would not operate on a satellite, but if their altitude is 700km, they are only 11% further away from the centre of the planet than we are. So, in contradiction to what I first thought, every time they go over the equator, they will experience an added gravitational pull from the equatorial bulge that will reduce their altitude, and therefore speed them up, followed by a gain in altitude and a slowing down as they leave the equator. I am too uneducated to work out the magnitude of these changes, but they are calculable, and it is still possible, to my mind at least, that even a tiny bias in the calculations, repeated every time the satellite passes over the tropics, might be having an effect on our knowledge of tropospheric temperatures in that part of the world. I do take your point, MAR, about the measurement of anomalies, but the thought lingers. Apologies if I have posted twice. I did a longer reply, but it suddenly vanished while I was proof reading it.